A New Level Of Enterprise Performance. 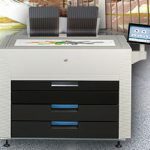 The KIP 870 workgroup and departmental print system is designed for high demand project requirements, with outstanding performance and reliability. High resolution colour and black & white mixed set production with built-in cost efficiency reporting. Expand the compact front stacking design with versatile rear stacking or folding accessories that increase productivity. 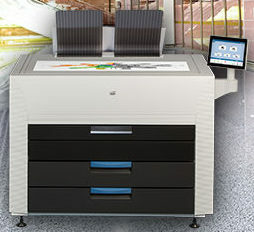 Touchscreen convenience offers advanced network cloud access, set printing and system management without a PC workstation.